Many years ago when my boys were little I drove a green and white 2CV. The boys loved the fact that the roof could be rolled back and they could wave to their friends out of the roof during the many hours of hanging about in car parks that school sport entails. My mother was less impressed by the window de-misting system, which was a flap under the front window that popped up! Not too comfortable on a freezing cold day when the last thing you want is icy, cold air streaming in at you:) I loved that car. So you can imagine my delight at coming across these in a car park in SW France recently. 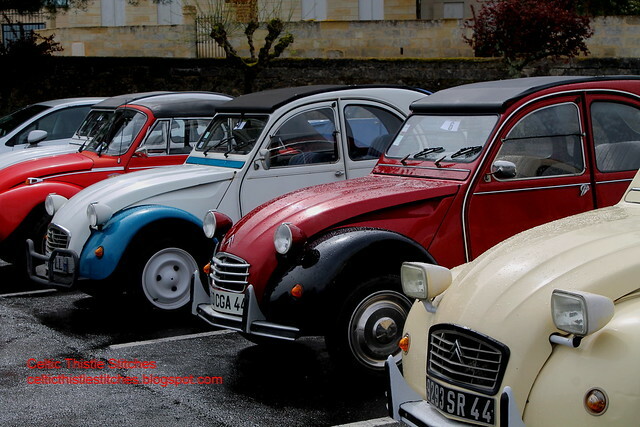 The cars might not be available any more but wine harvested when the first 2CV rolled off the production line still is. And plenty older than that for sale, no prices marked though so it might be cheaper to buy the car. 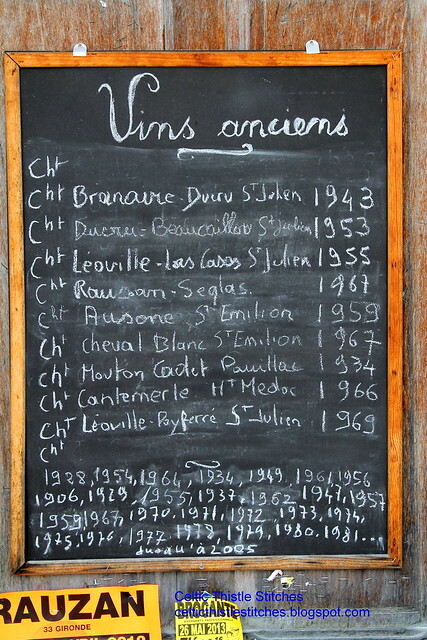 If wine older than yourself is not your thing how about a wine tasting of a more recent vintage. The town of St Emilion is a homage to fine wine but also caters to more realistic pockets. 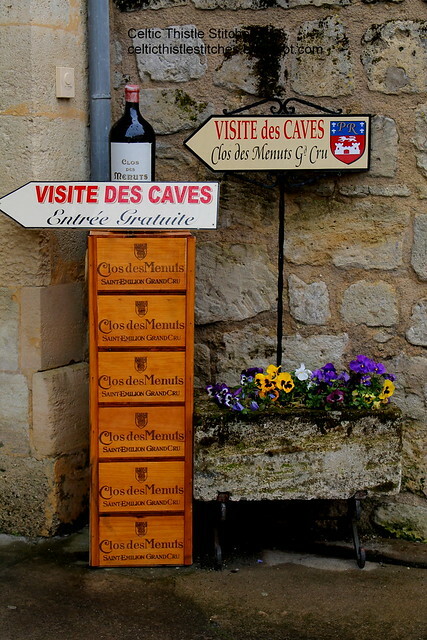 Recent years have seen huge controversy over the classification of some St Emilion wines with accusations and counter-accusations being flung around with gay abandon. When lots of money is at stake emotions can run high! Just in case you thought that I had completely forgotten about sewing on our break. 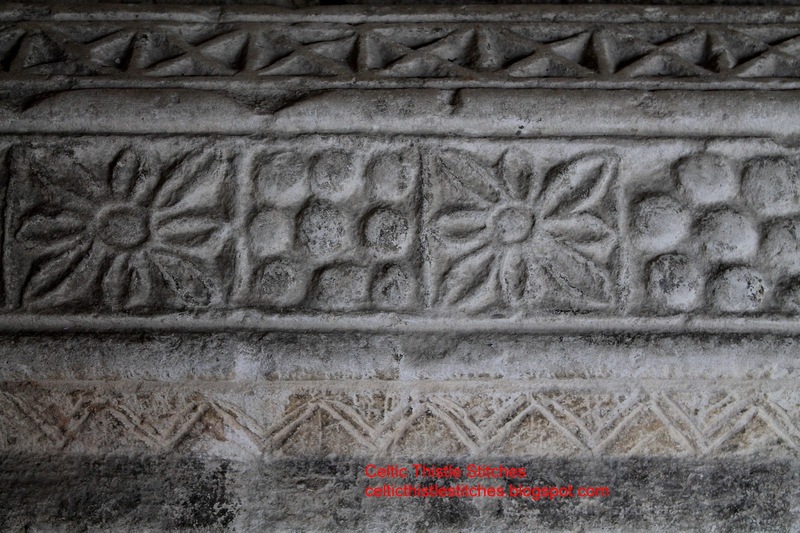 I found these engravings that would be ideal quilting patterns in the Cordeliers Cloister in St Emilion. They are lovely cars - someone once told me they were designed so you could get a goat in the back and I would love to think it was true! A goat and a crate of wine! I like those patterns - I've pinned them for some time in the distant future when I can FMQ. I love the idea of driving across a ploughed field with your eggs, goats, wine...You missed a trick there hanging out in school car parks! I loved my brother-in-law's sports car when I was younger.. hair flying in the breeze and all that, not to mention the bright mustard yellow colour. We probably couldn't get them over here, but I would have loved a 2CV by the sounds of it. Now the wine... I'd STILL love that!!! We took a ferry to Norway about 10 years ago, and waiting o board in Newcastle we watched dozens of 2CVs coming off, ordinary ones, ones with a boot, ones with trailers or bikes behind, it was an unforgettable sight!